rest of her life spreading the truth that no matter how deep the pit, God's love is deeper still. This timeless message now reaches a new generation in this special edition, which has been crafted especially for ages nine through twelve. Young readers will learn that every experience we face is the perfect preparation for the future only God can see. 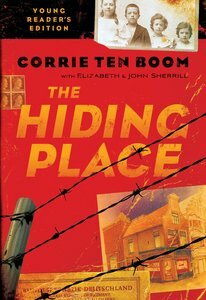 About "The Hiding Place (Young Readers Series)"
Corrie ten Boom (1892-1983) was born in Haarlem, The Netherlands. After being arrested in 1944 for helping Jews escape the Nazi regime, Corrie spent the last year of World War II in various prison camps. After the war, she was invited to share her experiences in over sixty countries and was honored by the state of Israel for her work during the war. Her life story, The Hiding Place, was originally released in 1971. In 1977, she settled in California, where she remained until her death in 1983, on her 91st birthday. She also authored Each New Day,Tramp For The Lord, In My Father's House, and I Stand at the Door and Knock. -Editorial Review. Americans John and Elizabeth Sherrill have edited Guidepost magazine and have authored several books.